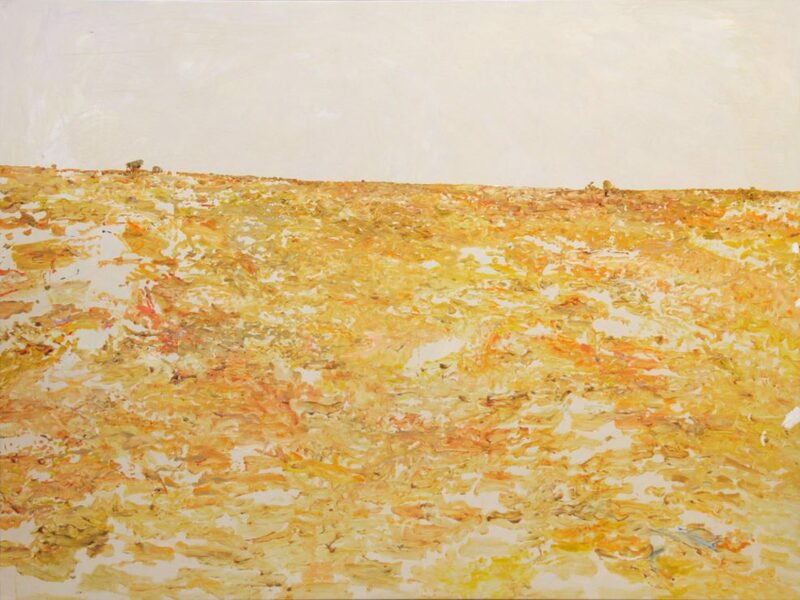 John R Walker, Morning Ridge Walking, 2016, archival oil on polyester, 75 x 109.5 cm. 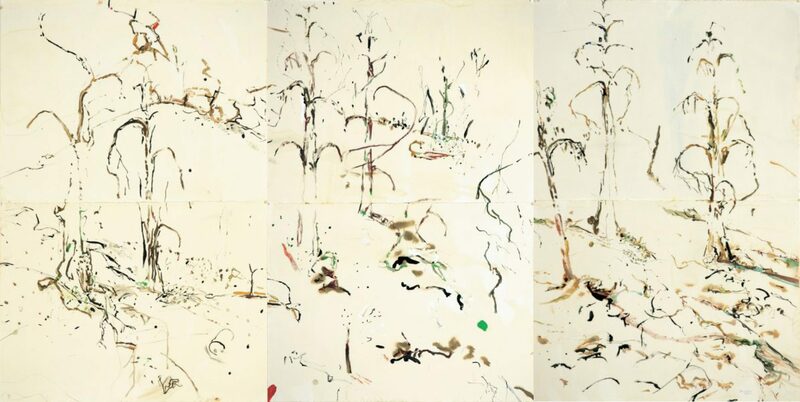 John R Walker, Callitris Oratunga, 2017, gouache on paper, 6 panels, 122 x 228 cm. John R Walker, West of Wilcannia II, 2017, archival oil on polyester, 179 x 239 cm. John R. Walker, best known for his landscape paintings, has been exhibiting for over three decades. 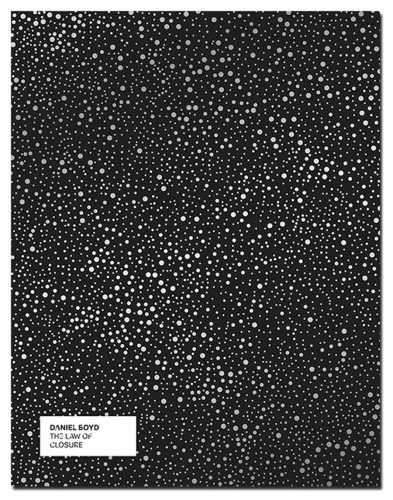 He’s been a fixture in the Sulman, Archiblad and Wynne prizes over the years; his works are often sizable and tend to have a carefully spare yet complex and contemplative nature. In particular, his Australia landscapes vibrate with a musicality while purely hinting at ridges, expanse and horizons. 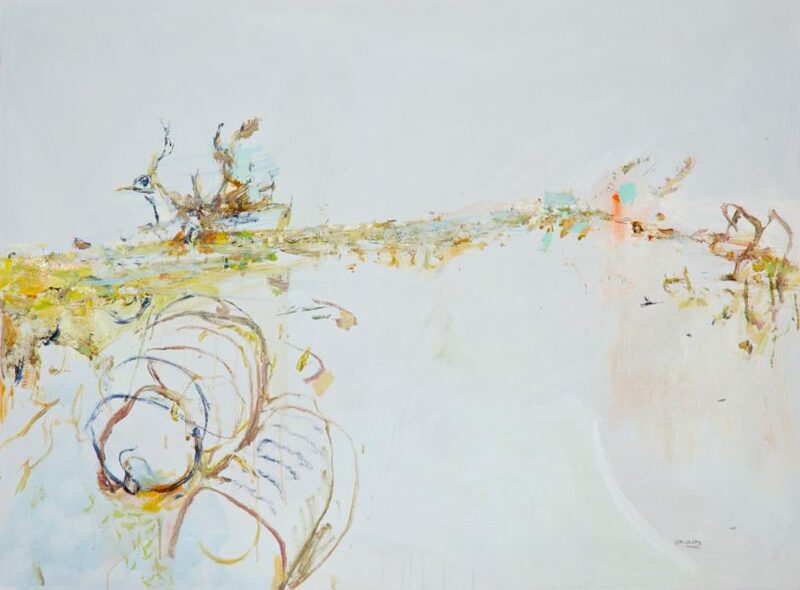 Rather than represent a single viewpoint of the bush, Walker has developed a way to express a fugue-like structure – a set of interwoven elements to invoke being in place. To explain for example, the frequency of the remote desert hills of South Australia’s Oratunga, Walker sent a link to Armenian sacred music. In the track, a lone mezzo-soprano voice soars in the meandering style of Eastern hymns, moving in pitch as a wind does as it move across the terrain. Poetry, philosophy and music are inextricably linked to Walker’s visual language. Growing up in Sydney’s peak, a generation before the lockout laws, Walker has since moved to Braidwood, a historic town in the Southern Tablelands of New South Wales. Varia Karipoff– What remains the strongest impression of growing up in Sydney? John R Walker– Suburban life in the 60s and 70s was safe but sometimes boring. One of the things I really looked forward as a child was going camping with the family; getting out of Sydney and heading for the bush. My strongest recollection of my life in my twenties, as a young artist, was how cheap living in inner Sydney was. I worked about 12 hours a week as a kitchen hand and that was enough to live a quite OK life. Also Friday and Saturday nights just about every single pub in the inner West had a live band; there was lots of music. It felt like there were lots of inner city warehouse full of artists, poets, filmmakers, musicians and more. It was a lively and adventurous scene. VK– You studied fine art outside the university system – art entered universities not long after you left school. What focus did your education take? What was the biggest lesson you learnt at art school? things like Zen, Japanese calligraphy, poetry and music that were a revelation for a boy from Peakhurst. Art training at that time was strongly oriented towards learning the skills necessary to make things. While this did mean that the conceptual side of things was somewhat secondary, the strength of this form of training was that it did not separate looking and making from thinking. VK– You relocated to Braidwood some years ago, what encouraged the move? JRW– There were two major reasons for the move. Firstly I had finally accepted that my given subject was the land and I needed to be in it, not just a weekend visitor. Secondly, the reality of Sydney real estate prices made it a necessity for me to move. I was able to move to Braidwood where I could afford a lovely historic house, on a large block of land and build a new studio. VK– Has your practice changed in accordance with the relocation? 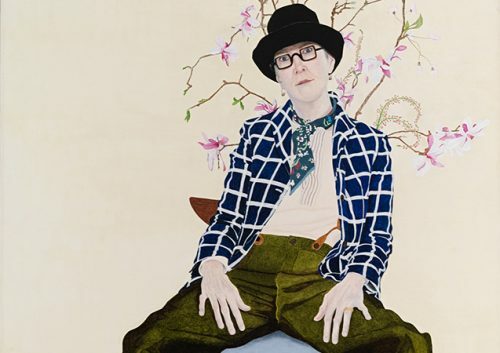 JRW– The main impact is that there is no real separation between my life and my work: I live in my subject matter. Living in a small country town means that when I go to work, it is just a 100-metre walk up to the back paddock. I don’t commute. VK– Your paintings have been described as filmic; do you see your series as a set of scenes? JRW– About 20 years ago, I spent a fair bit of time discussing my practice with the wonderful Bill Wright. I started to realise that to paint the experience of walking around in the bush required something other than single viewpoints; that it needed something of a fugue-like approach. Douglas R. Hofstadter’s book, Gödel, Escher, Bach had long been, for me, my main art theory inspiration. The core subject of the book could be summed up as ‘representation of representation’ and that mind itself is an emergent quality of this doubling, coded representation. The art of fugue is one of the recurrent themes of Gödel, Escher, Bach, indeed the book itself is a kind of meta-fugue. I had an intuition that a fugue-like structure, an image made up of distinct sequential elements that at the same time wove together to create a meta entity could work as a way of representing being in place. I guess this probably is where the filmic quality emerges. Apart from that, an early formative influence on my visual imagination has been filmmakers especially Kurosawa, and particularly his film, Rashomon. Poetry has always been important to me and good poems are like a series of particular visual images. VK– What are some of the innate qualities of the Australian bush that compel you to return to the subject? JRW– In the area of earth sciences, time is measured in metres down the trench and in kilometres across the country. For me, landscape is time spread out and is intimately interwoven with memory and history. VK– There is a strong sense of that vastness you speak of in your work. You have covered some remote territory in your location scouts too – Hay Plains is not a place that I had heard of before. Is there a place that stands out for you? JRW– Of all the places that I have been in the last 20 years, if I was to single out one as being particularly resonant, it would be Oratunga in the northern Flinders Ranges. It is a place with a particular ‘hum’, a spirit-colour-flavour that is a constant presence. 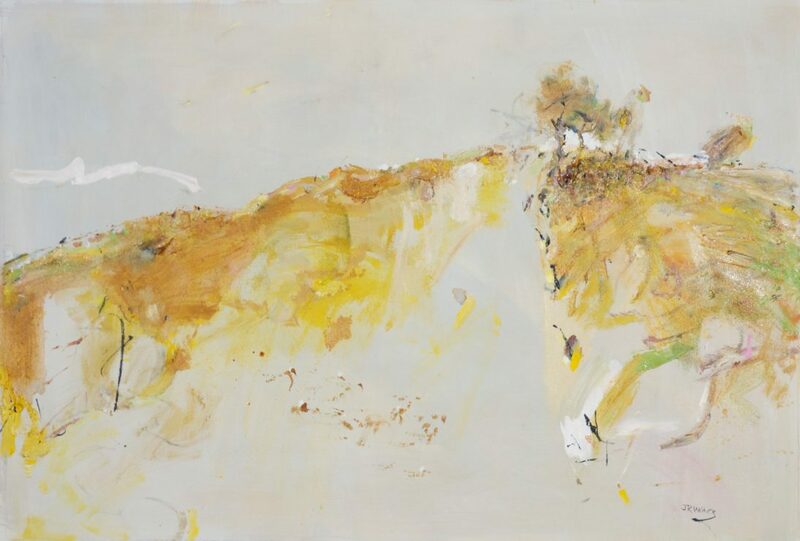 John R Walker, Old Drums, Flood Creek, 2016, archival oil on polyester, 76 x 102 cm. VK– The scale of your works is often sprawling, how does that tie in with your subject matter? JRW– A lot of my subject matter needs space, room to breathe. A fugue-like approach, that is, integrating a range of distinct yet linked elements, needs to be certain scale to work. VK– Can you talk about how you work – is the process somewhat intuitive? JRW– My approach has been to immerse myself in a place until something clicks – until I can actually imagine the place in mind and when (or if!) that happens, I can then paint the images that have formed. I have come to feel that the subject of my work is as much about seeing, and the mystery of that, as it is about landscape. 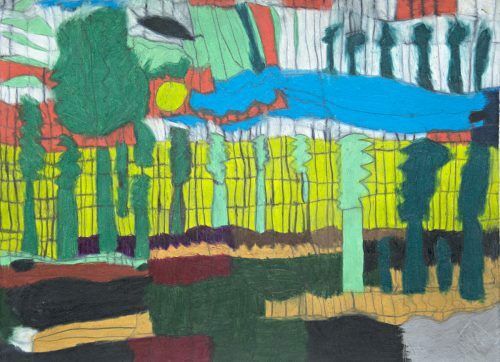 As John Berger said, “a drawing of tree shows not a tree, but a tree being looked at”. VK– What are you planning to show at Adelaide Biennale? JRW– My work for the 2018 Adelaide Biennial of Australian Art takes the form of a meta-triptych composed of a left-hand triptych, a central single panel and a right-hand triptych, running to about 14 metres. The title of the work is the Burra-Oratunga Suite. VK– What are you reading at the moment? JRW– Books that I have read or re-read over the last year that I really enjoyed are: the poetry of Basho, John Donne, Les Murray and Mark Tredinnick; Tom Griffith’s The Art of Time Travel: Historians and their craft; Nicolas Rothwell’s The Red Highway; Mike Smith’s The Archaeology of Australian Deserts; George Seddon’s Landprints: Reflections on Place and Landscape; Peter Vergo’s The Music of Painting and an essay by William Cronon ‘A Place for Stories’. I’m an avid subscriber to the New York Review of Books and New Scientist. Music is also important: Haydn’s Prussian Suites, Shostakovich’s 24 Preludes and Fugues particularly come to mind and ancient Armenian sacred music. These are part and parcel of my practice. Here we’ve selected a handful of Australian publications, from both independent and large publishers, to take on your summer travels.